Here is my latest creation to add to my collection, my UCS Nu-class attack shuttle. 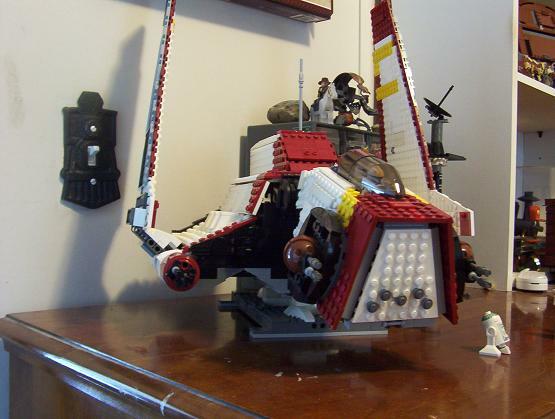 It took me 7 days to complete this massive ship, and I tried my best (with what availiable pieces I had) to make is to minifig scale. I'm quite pleased how the cockpit turned out but for some reason it doesn't look right with the rest of the shuttle. The front opens up but there is no interior. sorry. Wow very impressive indeed Any plans for a interior in the future? This is really great. Good job on a not-so-common ship. I tend to agree that there's something "off" about the cockpit. Maybe make the guns a smidge smaller like Jake said? The drop-down in front - did you run out of white? I think it would look much better with a white hatch than with the grey. If you've got the white pieces, definitely change that. Very nice, and quick work! You definatley have the look and colours just right. Thanks guys I think your right the guns do look a little off. Somthing to fix later. Firespray, I am planing on making an interior in the near future. Its kinda fragile at the moment so I have to go back and make it stronger. knapplc, I did start to run out of white pieces but I think I might be able to redo the front hatch, I need to look hard enough though. Eurobricks has a thread on this. Very cool. I am kind of iffy on the design of the ship buy you've done a beautiful rendition of it. I have to say, if Lego made this, I would buy a million. Wow, I'm stunned. You really did a great job with this. Much better than the lego version of the ship. Nce work there. I agree however. The cockpit dosent look quite right. And an interior would make this ship better. I saw the article on Eurobricks. I like how everyone is amazed that I built it in 7 days. It kinda was and night and day thing (its very boring here). I fixed the front hatch to white so I guess I just have to work on the interior! This is great! Keep building. Wow! This is great i'm impressed. Forgive me for waiting till now to express my amazement of this model. Minifig scale and an interior to come? Awesome! That is a Nice build that you can be proud of. The yellow is not overbearing like the Lego set. I'll encourage more details/features if you will. A raising/lowering cockpit, white grilles over light gray plates in the wings. Is the the smallness of the brown balls giving the illusion that the cockpit is too tall? TLC should release this set. I'd probably buy it! I think that comment was refering to this builder's model. Very impressive! I like this very much. Except for one thing. Everything is coated with plates. Which is great! It gives it a homogeneous look. Except for the rear part of the top fin. Where we see naked 2x4 bricks and 2x2 inverted slopes. If you could coat the bricks, and maybe use 3x3 corner plates to cover the white inverted slope, perfection would be complete. Nonetheless, an outstanding model! Keep it up. Wow, amazing work, OOM-9! TLG's version looks like crap compared to yours. It makes me want to get back into Lego again. Quantumly amazing. It's lovely to see ships that are accurate to the real size. I'd love to see more angles. Do you have a link? I just finished widening the wings and I'll begin on the interior soon enough. The olny problem is I have no idea what it looks like. Oh and Legostein I'll also cover up those bricks. I did not realize how large it was until I saw R2 in the picture!! Incredible scale!! If you can get a hold of it, newest CW episode showed a bit of the interior.